At the hospital, her baby is taken away. Levy will never see him again. She has a photo of him taken in the few minutes he was alive; that is all. The following morning she is told she has had a placental abruption, which can occur from heavy cocaine use, high blood pressure, or simply, as apparently in her case, from being old. She returns to the US, and several weeks later her partner of ten years goes into rehab for alcoholism. Soon, they separate. Within a few months, she will have lost her son, her wife, and her home. It’s a story that should only elicit sympathy. What’s curious, though, is how Levy frames it. For her, it is a tale of pride before a fall – at first she believes she can have it all (an incredible career, a loving partner, motherhood); later she excoriates herself for her stupidity. Alas, this means that this sorrowful memoir perpetuates the myth that if women do try to have it all, they will be punished – and it does so in a way that’s in turn naive, unfair to Levy and, finally, irrelevant to the great majority of women. Before her miscarriage, Levy portrays herself as insatiably ambitious, an Icarus for whom life is at first marvellously co-operative – by her mid-thirties she is a New Yorker writer with a successful book (Female Chauvinist Pigs, published to acclaim in 2005), a beautiful home, a loving wife who wants a child with her, and a friend/babydaddy who will pay for this child’s college education. Very little, she says, has “ever truly gone wrong for her”. But by wanting it all and going after it (which includes having an affair and travelling to Mongolia for work when five months pregnant), Levy believes she has invoked the wrath of fate: “I had boarded a plane out of vanity and selfishness and the dark Mongolian sky had punished me”. This is the story she tells herself, and us, despite the fact that no-one else suggests her miscarriage is her fault. Before she goes, doctors say it’s fine to fly. Afterwards, they reiterate it. Yet it’s a stick – one of many – that throughout the memoir, she chooses to beat herself with. The idea that women can have it all and its counterpoint – that if they try, they will be punished – are myths. Women, especially western women, are bombarded with them from childhood; we are also told that if we don’t manage to have it all, we’ve failed. We are schooled in these three beliefs simultaneously and endlessly. This is an attempt to turn us into desiring machines, greasing the wheels of capitalism by telling us who we need to be (or what we need to buy) to be happy or, at least, not to be punished or ashamed. Our fertility has become a particular stick to beat us with, as has being single or too ambitious. These fictions have no relation to the infinite complexity of life, nor to anybody’s personal relationship with achievement, happiness, failure and punishment. The best thing women can do is deconstruct them by pointing out, again and again, that they are so reductive as to be meaningless. (Of course, one way you can do this is by writing – and reading writers – who reflect and honour, rather than diminish, life’s complexity). But Levy neither interrogates the cultural basis of these myths nor mounts a resistance against them. Instead, she fully internalises them, and blames herself. Rather than this mea culpa for her apparently bungled trajectory of selfhood, Levy should have reckoned with her context. She should have interrogated a society that forces women to internalise both the aspirational narrative and its double dark underside, the fear of punishment and the shame of failure. She does loosely blame ‘feminism’ (“We were raised to think we could do what we wanted,” she says), but The Rules Do Not Apply mostly reads as if Levy herself is entirely at fault. She is not. We need to rigorously, collectively push back against such individualised beliefs and instead ask how and why they are perpetuated. There’s a coruscating review of ‘The Rules Do Not Apply’ by Charlotte Shane in The New Republic which looks at the context of ‘having it all’ in a different way – but one that’s just as relevant and necessary. Shane reminds us that ‘having it all’ is anyway, of course, an elitist rather than a universal myth. It is ‘garden-variety white entitlement’, belonging to a specifically privileged echelon of feminism. She is spot on. Who even dare imagine ‘having it all’ other than those whose lives enable them to? “Levy is ambitious,” Shane points out, “because she’s been set up to satisfy that ambition; she climbs the metaphorical mountain not because the mountain is there but because the sherpas, the tools and the cheering crowd are there as well”. Correctly, Shane lambasts Levy for “presuming her perspective is universal and her experiences are uncommon, when it’s the other way around”. At one point, Levy, whilst driving in her car, notices “the people – from Guatemala, from Mexico – working in the fields, the sun pounding down on them indifferently. I wondered if everything that pained me would seem ridiculous to those women, or if some of our problems were the same”. This is a fascinating question, but she takes it no further. There is a rush to get to the next part of the narrative – Levy’s partner’s suicide attempt – and while it’s more than understandable that we remain in a personal world here, we’ve just bypassed one of the few moments in the book where a wider understanding might have been contemplated. Indeed, the problem with being a New Yorker writer with a Random House book deal is that your book is inherently an object lesson in privilege; you cannot get away from it – and meanwhile, the multitudes of women who won’t get a chance to tell their stories remain in silence. We pass by them in the car and move on. Levy has no obligation to report from beyond her own experience, but the net result of privilege at work means that their stories, as ever, are less likely to be heard. Shane says The Rules Do Not Apply is therefore a “monument to obliviousness” and questions the point of a grief memoir from someone so well-insulated. This is fair, but I wonder – going back to Levy’s brief thought about whether “some of our problems were the same” – if there is something about the experience of grief that is the same for everyone. Not every aspect of it – it’d be insane to rule out the effect of having your own home, being able to afford a therapist, having a flexible, well-paid job, subsequently being able to afford IVF, and getting to process your experiences in a much-anticipated memoir – but still, something familiar, something cauterising, at its heart. Even so, I would have loved it if Levy had stepped away from herself just briefly and ventured into the terrain of what miscarriage, stillbirth and loss of a child are like for people who are not her, or not like her. I’m convinced that in the right hands, something that showed the voices of more women could have been written. That The Rules Do Not Apply is not this book is partly the market’s fault. Levy wrote a harrowing piece about her miscarriage in The New Yorker which won the National Magazine Award for Essays and Criticism and was the basis for this memoir; it’s not hard to imagine how it was packaged for Random House – personal, intimate, the superstar journalist finally turning her powers on herself. Her prose, both in the essay and the book, is always lucid and self-aware. It’s also worth considering here, to quote Heather Havrilesky, whether all artists are required to keep tabs on their own privilege, or if indeed (insert deeply bored eye-roll here) it’s only the responsibility of women. Men get away with expressions of blinding privilege to a far greater degree, yet are rarely shot down in the same way. The other mitigating factor is Levy’s dissection of how grief works. As she says, it is felt so bodily, and it weighs so heavily, that sometimes all you can do is slog from one day to the next. It’s a time when you turn in on yourself – and that’s not narcissism, that’s suffering, plain and simple. A wounded being curls up in defense; grieving is a time of such rawness that you instinctively minimise contact with the outside world for fear of further hurt. Yet given time, it is perhaps restorative to turn one’s focus outwards. Levy could have done that – she could at least have held the world to account for its impossible illusions. Ironically, to have done so would have been a truly ambitious feat. The Rules Do Not Apply is published by Penguin Random House. Author bio courtesy of the same. 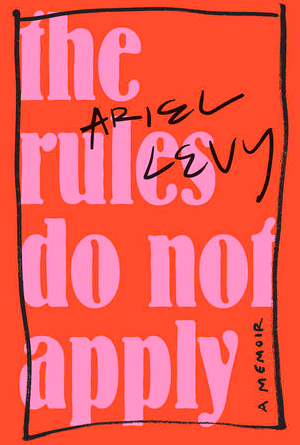 Posted in Book reviews and tagged Ariel Levy, having it all, myth, The Rules Do Not Apply. Bookmark the permalink.